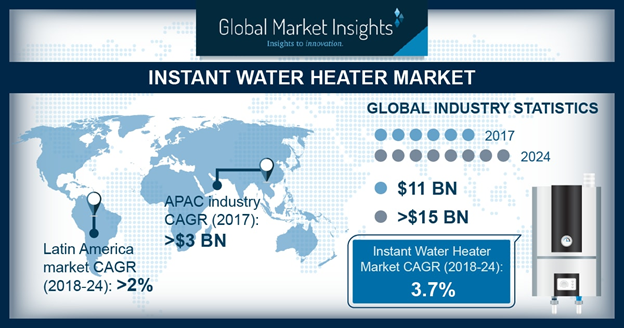 Instant Water Heater Market size will surpass USD 15 billion by 2024, as reported in the latest study by Global Market Insights, Inc. Rapid infrastructural development on account of increasing funding by respective government authorities will fuel the tankless water heater market growth. Ongoing replacement of conventional heating systems primarily across residential establishments on account of strict industry norms have instigated the industry growth. In addition, growing development of zero emission buildings coupled with government mandates toward deployment of energy efficient technologies primarily across newly constructed properties will further augment the business landscape. Rapid service sector growth along with increasing funding toward development of multifamily apartments will foster the U.S. instant water heater market growth. Technological advancements over the past decade have led to the development of innovative and cost-effective technologies. Introduction of leakage detection system, remote control software and multiple communication features will further attract a large customer base. Compact designs, low power consumption and on demand hot water supply are some of the key features that will drive the tankless water heater market. Increasing need for instant hot water supply primarily across offices and educational institutes will augment the business landscape of tankless water heater market Furthermore, low standby losses along with considerable reduction in the heating bills will further lead to product adoption. Increasing need for constant hot water supply across hospitals and hotels along with growing preference for on demand heating will stimulate the commercial water heater market. Highly efficient performance owing to integrated flow sensors along with significant savings in utility bills will further lead to product adoption. Furthermore, worldwide commencement of smart cities projects will positively influence the industry outlook of tankless water heater market. Asia Pacific tankless water heater market size was valued over USD 3 billion in 2017. Considerable rise in disposable income on account of ongoing infrastructure projects primarily across China and India will complement the industry landscape. Increasing foreign investment on account of flexible FDI and trade policies will further support the business growth. In addition, growing service sector along with ongoing construction of commercial properties including educational institutes and offices will encourage the product adoption. Easy installation, reduction in components cost and low power consumption will fuel the electric water heater market growth. Wide electricity supply network and simple design structure are the key factors responsible for product adoption. High preference over gas substitutes on account of low standby heat loss and high energy factor coupled with less regulatory intricacies associated with electric variants will further lead to product penetration. Key participants operating across instant water heater market include, Rinnai, A.O Smith, Bosch, Rheem, Ferroli, State Industries, Linuo Ritter, Haier Electronics, Bradford White, Jaquar, Saudi Ceramics, Hubbell, Ariston Thermo, Vaillant, Whirlpool, Viessmann and Kanch Water Heaters.